SANTA AND MRS. CLAUS WILL BE COMING TO TOWN — The annual Hometown Holidays celebration returns this weekend with events taking place across the region on Friday and Saturday. Santa and Mrs. Claus are scheduled to arrive in downtown Guilford again on Friday, Nov. 30 for the evening tree lighting. Piscataquis County sets aside one day early in December to celebrate the wonder of Christmas and the magic of the holiday season. This year, Monson, Guilford (Nov.30), Milo, and Dover-Foxcroft are participating. All events take place on Dec. 1 except where noted and the following is a tentative schedule from each of the participating towns. Guilford will hold all Hometown Holidays events on Friday, Nov. 30. Events begin at 5 p.m. at the Guilford Historical Society Museum, where children will join Julie and Friends to carol their way to the Guilford Subway for a quick snack and a children’s coloring contest. Afterwards, families are encouraged to stop at Davis Brother’s Furniture, winner of 2015 and 2016 Hometown Holidays Traveling Trophy for their breathtaking displays. Families can enjoy the music and take photos at this year’s beautiful Old Fashioned Christmas window display, and then head over the river to the Guilford Historical Museum for hot cocoa and a visit with Santa’s helpers to the make and take reindeer food table. 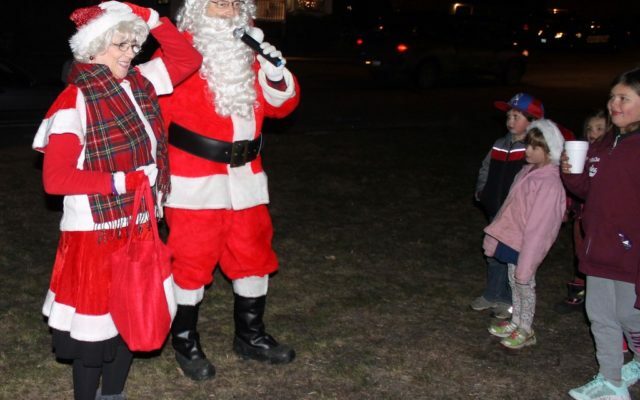 At 6 p.m., Santa and Mrs. Claus will arrive by fire truck to help the children light up the town Christmas tree. All are invited to join in at the annual Christmas bonfire for more caroling. At 7 p.m., everyone will take a stroll to the Guilford Memorial Library to wrap up the evening with a special story-time and treat. Dover-Foxcroft has a jam-packed schedule beginning at 9 a.m. and ending late into the day when Santa packs up and heads back to the North Pole. The festivities begin bright and early on Saturday, Dec 1 at the Dover-Foxcroft Congregational Church with the annual Kris Kringle Coffee from 9-11 a.m. A $3 donation is requested. The Thompson Free Library will host the Dover Cove Farmer’s Market and offer ornament making for children from 9 a.m. to noon. Community members are excited to have the Miracle Tree Event returning to Dover-Foxcroft this year, held at The Commons at Central Hall from 9 a.m. to 4 p.m. on Saturday and from 10 a.m. to 2 p.m. on Sunday, with the final drawings at 4:15 p.m. Sunday. Stop in to buy a raffle ticket for a fully decorated tree (there will be many to choose from) and the presents resting underneath; all proceeds go to benefit local charities and those less fortunate this Christmas. Families can also enjoy a bake sale and face painting during the event and a reading of Christmas stories by local author Joe Siccardi. Bob’s Sugarhouse will be open from 9 a.m. to 5 p.m. in celebration of Hometown Holidays and the owner, Bob Moore’s birthday celebration, offering discounts, door prizes, refreshments, sweets, Christmas music, birthday cake, and so much more. Also beginning at 10 a.m., the Ultimate Gift Giveaway returns — a Hometown Holidays event that was loved by the community back in 2016 and tremendously missed in 2017. This event is organized by Faith Bible College International of Charleston in collaboration with local churches in the Dover-Foxcroft community, offering a 100 percent free yard sale, kids activities, and a raffle for higher end items. FMI call Spencer Hawbaker at 496-9869. For the first time this year, Dover-Foxcroft’s new Head to Tails Pet Store is holding a Holiday Pet Bonanza, comprised of two educational classes where kids get one-on-one interaction with the animals in the store while learning more about them. From 10:30-11:30 a.m., kids can interact with Cupcake the Rat while learning why rats make awesome pets, and even make a rat kids craft to take home. From 1-2 p.m., kids will interact with and learn about the Russian Tortoise and make a tortoise craft to take home. From noon to 2:30 p.m., PRYMCA will be inside the multipurpose room at the Union Square Mall running Reindeer Games for kids of all ages. Snacks will be provided by Piscataquis Healthy Food for All. Across the hall, the Color of Life Studio will offer snowflake making beginning at noon and ending at 4 p.m.
Do your children love making gingerbread houses? Then head over to Pat’s Pizza between 12-3 p.m., where Pat’s will hold a gingerbread house-making event for the first time this year in their banquet room. Also starting at noon is a new activity for kids in the community, “A Grinch Christmas Interactive Word Scrabble Game.” Start your journey at Dover True Value where you will be directed to local shops in the downtown area to find presents the Grinch left around town and help him discover the true meaning of Christmas! A community favorite, letter-writing to Santa, will be held again at Center Theatre from 12:30-1:30 p.m., with Center Coffee House providing free cookies and hot chocolate for children who attend. Several of Santa’s helpers from the North Pole will be there to help, and there’s a chance Mrs. Claus will be there too! Did you know that Santa answers every letter? Need some gift wrapping done? From 12:30-4 p.m. at The Commons at Central Hall, Ribbons and Bows for Your Holiday Woes Wrapping Services will be on hand (for a nominal fee) to get all of your wrapping done, faster than you can say Rudolf the Red-Nosed Reindeer. Hometown Holidays isn’t just for the kiddos! From 1-3 p.m., Carpe Diem Salon partners with My Wild Fern to host an adult holiday craft-making event (at Carpe Diem Salon). Lights snacks and drinks will be offered, as well as a complimentary Christmas Room spray from DoTerra Oils. An RSVP for this event is required by Nov. 29, do so by calling Sarah at 965-5186 or by emailing mywildfern@gmail.com. There is a fee for this event. From 3-5 p.m., horse drawn carriage rides by Nostalgic Limo Horse & Carriage Service, generously sponsored by Foxcroft Veterinary Services, will be stationed on Lincoln Street, and Modern Image Salon will offer holiday treats to those waiting for their ride. Residents should be aware that Lincoln Street will be closed to through-traffic from 2:30-5:15 p.m. on Dec 1 while the horse and carriage rides are happening. From 4-5 p.m., My Wild Fern, located near Dover True Value, will offer recycled Christmas ornament making. Line-up for the Festival of Lights Parade will begin at Foxcroft Academy at 4:30 p.m. Businesses interested in being in the parade should contact the Hometown Holidays committee ASAP at 564-7533. The parade begins at 5 p.m. Organizers ask all homeowners on West Main Street to turn on their Christmas lights as Santa goes by. Families waiting at the end of the parade in front of the Dover-Foxcroft fire station can enjoy Christmas caroling by the Dover-Foxcroft Restoration Church until Mr. and Mrs. Claus arrive, at which time the crowd will count down to the tree lighting (with a twitch of Santa’s nose). Children may visit with Santa and Mrs. Claus inside the fire station, where families can also expect to find crafts and activities, photo opportunities, and snacks and beverages for sale. This year, the Dover-Foxcroft Hometown Holidays Committee is holding a mitten drive for children who need mittens this winter. After meeting with Santa, children can choose one pair of mittens from the tree. Those who wish to donate to the mitten drive can do so at mitten drop box locations including the Piscataquis Chamber of Commerce, The Raven’s Attic East, Rowell’s Garage, and the Thompson Free Library before Nov. 28. Families who want to make a night of it can head back over to Center Theatre after their visit with Santa and Mrs. Claus for a free viewing of “A Muppet Christmas Carol,” sponsored by the Center Theatre. Also at Center Theatre on Sunday the 2nd, there will be a Christmas Concert featuring the North Country Strings for with children under 10 admitted free. On Sunday, Dec 2 at the Dover-Foxcroft Congregational Church, the Sebasticook Valley Community Band will be performing a free concert from 2-4 p.m. The Dover-Foxcroft Hometown Holidays Committee would like to sincerely thank all businesses and individuals who sponsored and contributed to this event, including Foxcroft Veterinary Services, Rowell’s Garage, Dead River Co, JD Raymond Transport, Steinke and Caruso Dental Care, Camden National Bank and French Construction. Special thanks to all the downtown business who willingly alter how they do business for one weekend in December to make it memorable and enjoyable for families. Finally, a big thank you to all the volunteers who make this magical event happen. Milo kicks off the festivities with a breakfast with Santa beginning at 8 p.m. at the Penquis Valley School cafeteria; running until 10 a.m. with a small admission fee. The Park Street United Methodist Church will hold a Christmas Fair from 9 a.m. until 12:30 p.m., with a corn chowder luncheon at 11 a.m. The Milo Town Hall dining room will offer crafts and snacks from 3-8 p.m., and from 4-7 p.m. the Piscataquis Amateur Radio Club will host “Elves on the Air,” inviting area children to talk with Santa’s elves over their radios. Parade line-up will begin at 4:30 p.m. at the American Legion hall, those interested do not need to pre-register just show up decorated. Parade start time is 5 p.m. and will run from Riverside Street to JSI and back to the Community Christmas Tree at the Milo Town Hall. The tree-lighting will take place at 5:15 p.m. where community members will join in caroling with Stephanie Gillis’s singers. Hot cocoa will be served. Santa will be waiting inside the town hall second floor lobby to visit and take pictures with children at 5:30 p.m. There will also be hayrides at the town hall from 5:45-8 p.m. This year’s door prize is the Christmas tree from Santa’s float, provided by Al’s Balsam Christmas Trees. The Milo Hometown Holidays Committee sincerely thanks all sponsors, including Lumbra Hardwood, Al’s Balsam Christmas Trees, Three Rivers Hardware, Lewis Nuite, Stephanie Gillis, and all volunteers who help make this community event possible. Monson will hold the annual Kris Kringle Craft Fair at the Monson Gym from 9 a.m. to 3 p.m., with a luncheon at 11 a.m. and Santa’s arrival at 1 p.m. FMI call 944-0798. All schedules will be posted on the Piscataquis Chamber’s website and on Facebook. For more information, contact the chamber at 564-7533. Children throughout the county can mail letters to Santa from post offices in Dover-Foxcroft, Guilford, Sangerville, Abbot, and Monson and at the library annex in Greenville. Will’s Shop ‘n Save of Dover-Foxcroft also has a mailbox for letters to Santa available. The final pickup for mailed letters to Santa is Wednesday, Dec. 19 so that Santa has enough time to reply. All letters are answered so it is extremely important to include a correct mailing address with house or apartment number.